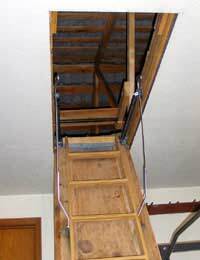 Home > Using Your Loft > What Can an Un-Converted Loft be Used For? Just because you may not have the money to convert your loft, it doesn’t mean that you still can’t use your loft space to store your old toy collection or adapt it to add value to your home. The biggest loft use for an unconverted loft is loft storage, you don’t necessarily have to go fitting expensive flooring and heavy insulation if you are going to store a few odds and ends in your loft space. Don’t however store valuables in an unconverted loft as there is a danger of these going damp and getting ruined if the loft is not properly insulted to stop this. You don’t necessarily have to spend hundreds of pounds though to equip your loft fro loft use ready for storage. You will find that a lot of DIY shops will be able to offer damp proof containers for loft use and storage solutions for your loft. When it comes to what to store in your loft you should try and avoid anything that is heat or water sensitive, so don’t store old books and papers up there, on top of any damage they may get they can also be a huge fire hazard. The best thing to put in loft storage is work tools or old furniture, as these will not be as sensitive to the conditions in your loft. If you are planning to store heavy objects in your loft space you should make sure you have adequate flooring, so you may have to put more floorboards in your loft for this loft use. Just because your loft is sitting idle, it doesn’t mean that it can’t be saving you money at the same time. You may not have any intention of converting your loft or using it for loft storage, but that doesn’t mean you can’t put it to other uses. You can insulate your loft to make sure that it is giving out as little heat as possible. You don’t need to convert your loft to do this, and you can fit the insulation yourself. The insulation will stop any heat escaping through your loft, it will also cut down on your energy bills, giving you good loft use. Another good way of using your loft to cut down on your bills is to install solar panels on the outside of your loft rooms. Although it might be expensive to do at first it will save you a lot of money in energy bills. Before installing solar panels though you will have to check that any work you do will comply with loft regulations. If you do not plan to convert your loft you can still put it to good use, it may not be classed as a standalone room in the eyes of an estate agent, but you shouldn’t ignore the potential your loft room or loft rooms have. Too many people are guilty of neglecting their lofts and not going up there to explore its various uses. If your loft is too small for conversion or you just don’t have the money, don’t despair, use the loft as storage and take advantage of the extra storage room you have in your loft to create more space in the main rooms of your house. As long as you consult a builder before you carry out any major work and check that you are not breaking any loft regulations then you can still adapt your loft many ways.